Beef-bone broth has become all the rage in recent years, due to the popularity of the Paleo diet, one that promotes eating lots of meat as well as this type of rich, nourishing broth. It is said to have all kinds of health benefits, since it’s rich in protein, gelatin, and anti-oxidants. You can sip it as a protein-rich snack or meal all on its own or you can strain the broth, discard all the vegetables (the meat should be tender and still full of flavor), and use it as a base for any meat soup. For drinking the broth on its own, cook it for the full 3 hours. If you are using it as a base for other soups, simmer it for 1 to 1-1/2 hours to avoid overcooking the meat, which you’ll be adding to the soup. RECIPES: What to do with this broth? Use the homemade beef broth as the base of Kathy Gunst’s French Onion Soup and Sicilian Black Lentil Soup. 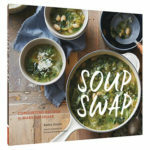 ON-DEMAND: Listen to Faith and Kathy talk about this nourishing broth as well as how to start a soup swap of your own. Please support The Faith Middleton Food Schmooze® and all of WNPR’s programming by swapping a pledge of $8 a month for this book. Make your pledge now. Thanks. Position a rack in the middle of the oven and preheat to 425°F [220°C]. 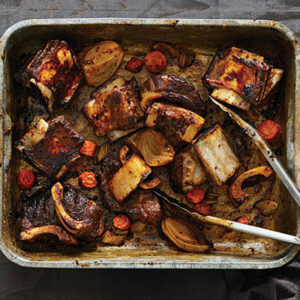 In a large shallow roasting pan, combine the beef shanks and short ribs. Coat both sides of the meat with the olive oil and tomato paste and season with salt and ground pepper. Add the onion, carrots, and celery. Roast for 15 minutes, flip the bones and vegetables, and roast for another 45 minutes. (The goal is not to cook the meat completely but to brown the bones enough to give the broth a rich, deep color.) Remove the pan from the oven and deglaze with the vinegar, scraping up any bits clinging to the bottom of the pan. 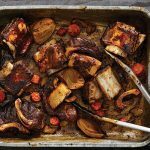 In a large stockpot, combine the roasted bones and vegetables, the pan juices, parsley, bay leaf, peppercorns, and garlic and season with salt. Add enough cold water to just barely cover and bring to a boil over high heat. Turn the heat to low and simmer, uncovered, for 45 minutes. Partially cover the pot and simmer for another 1 to 3 hours (see headnote), or until the stock has a rich, full flavor. Taste and adjust the seasoning, adding more salt and ground pepper if needed. The stock will be quite fatty. The best way to deal with this is to chill it for several hours (or preferably overnight) and remove the layer of hardened fat from the top with a large kitchen spoon. Then reheat the broth, strain it, and let cool. The meat will be exceptionally tender; reserve it for soups and salads.